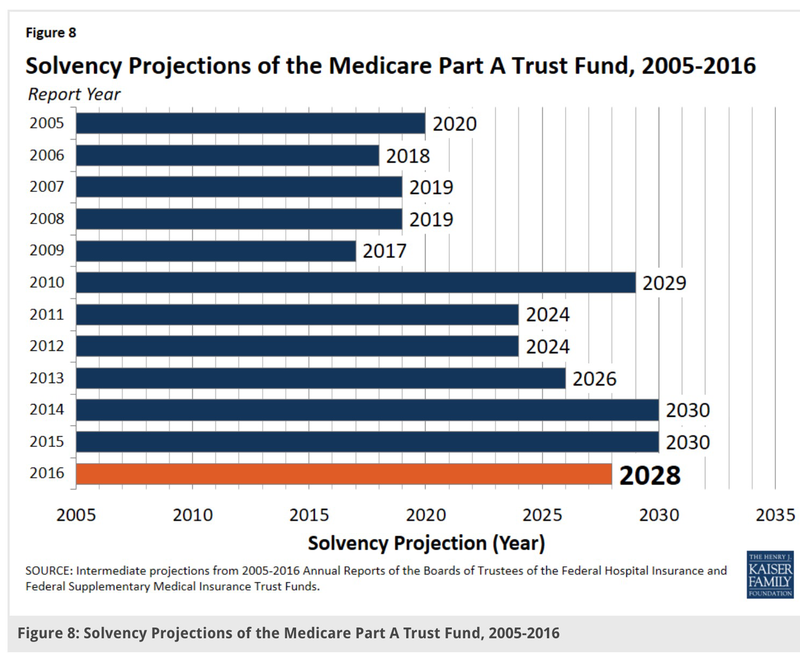 These projections for insolvency of the Medicare Trust Fund are six to seven years sooner than for the Social Security Trust. Paul Ryan, for instance, said on Fox News on Thursday, that “because of Obamacare, Medicare is going broke.” That statement is false. According to the Medicare trustees, cost controls in the A.C.A. are one of the reasons that the system’s hospital trust fund is projected to remain solvent through 2028 — 11 years longer than before the A.C.A. was enacted. But as you see, the solvency period varies from year to year both before and after the implementation of the ACA so the actual impact of the ACA on Medicare is yet to be determined. 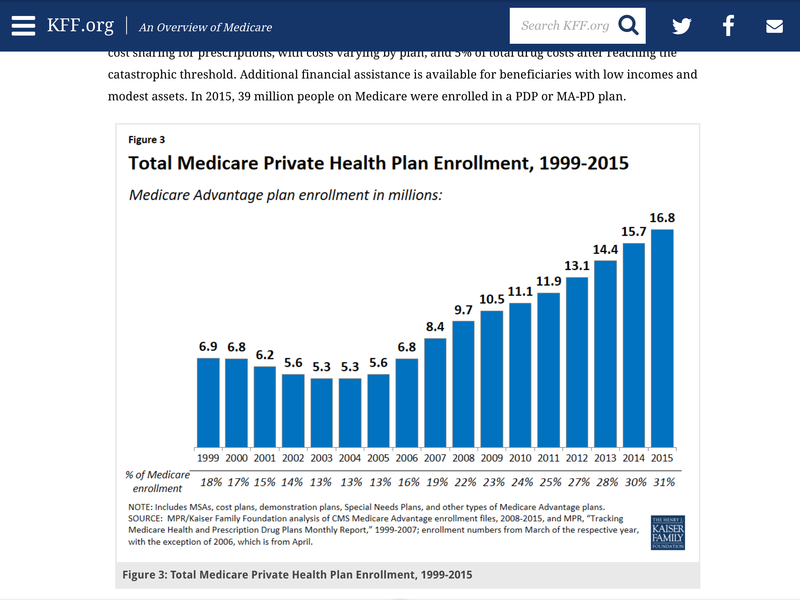 In any case, currently Medicare has twelve years before it hits a crisis. In addition, the Medicare trustees urge that legislative action be taken to preserve Social Security. Mention privatization in any form and you become the target of the political left. There are some problems with privatization, especially if proposed vouchers to pay for the insurance do not keep up with actual costs; a strategy employers are using for their retirees. However, to a large extent Medicare is already privatized. In addition, Medicare doesn’t work without private supplemental coverage. The trick is to change Medicare, save money and not shift those costs to beneficiaries or take them from physician’s pockets. Maybe Trump can get the Mexicans to pay for it instead of the wall. I think the first step is for the government to put a limit on Medicare and instead of writing a blank check to everybody (doctors, hospitals, drug companies, beneficiaries). This would have to be done over years just as many companies cut their benefits and pensions so that people can adjust. The next step is stop promising everybody that they can live forever and that society is not willing to spare no expenses to do it. Just because they have knee replacements at age 50 doesn’t mean the government should pay for one at age 80. Yes I know that there are a lot of moral and ethical problems here but I want to point a new show on TV called Pure Genius where this billionair built a hospital and his team cures everybody who walks through the door with some high tech stuff that is experimental and he foots the bill (I assume). Now people are going to see this and demand the same from their doctors and Medicare. A lawyer friend told me that jurors want to see DNA reports and the live video footage like they see on NCIS at trials now because they believe it is available for every case or the person is not guilty. The way the TV shows and the drug ads on TV go, they all have the drugs to make you live forever and Cancer Treatment Centers of America can cure you. The third thing that I would like to see is some kind of sliding scale for billing. A person with a family who works hard and earns $30K/yr should not have to pick between dying or treatment because he can’t afford the right insurance or the right treatment compare to somebody making $60K, $90K, or $900K for the exact same disease. Now that person who makes $900K if they want more frills, sure they can pay for it if they want. Not that I want to pay more for my health insurance but where I work, the entry level employee with a family pays the same price for insurance as the highest paid worker. In some cases that means the medical liability could be 50% of their annual salary. If there was a way to make this fair, I would behind it 100% percent and I assure you, I would end up paying more. Of course what is fair will be the problem but the bad luck of a disease should not be compounded by your ability to get a high paying job. And yes I know that there are problems with that too but at least everybody would now be paying the same percentage it instead of free or footing the whole bill because of some magically income limits. “The trick is to change Medicare to save money and not shift costs …” Reminds me of “make an omelet without cracking any eggs. “. Your only option to accomplish that is for someone to pay more (utaxpayers, benefiviaries, the French, etc.) or for someone to get less (beneficiaries, practitioners, administrators, fraudsters , etc.) or both. I suppose you can propose to thread the needle and focus on “waste, fraud and abuse”. Or, maybe you could look into options that would curtail demand – by limiting access, as we know preventive services often increase longevity, and over time, medical expense too. Your choice? Me, I favor asking beneficiaries to shoulder the costs they incur, or at least fund the benefits they qualify for. I’ve been telling you about Lyan Ryan for months. He is committed to destroying Medicare and Social Security as we know it. The only time he’s not lying is when he’s not talking! As Speaker of the House, he could strive to remedy the problems, but his perverse ideology drives him to destroy these benefits for seniors. In his world, there are only “makers” and “takers”. If you need Social Security and Medicare, you are a despised “taker”. Anyone who is not wealthy by retirement age is lazy and does not deserve a longer life. Every sentence in his address t the Republican convention in 2012 was false! Fact check it.